Here are my lavender bags as promised, another job crossed off the Christmas to-do list. There's a lovely smell of lavender around the house now, much to the annoyance of the men of the house who keep complaining of stinging eyes and feeling sick - what are they like? Gorgeous Vicky, I can almost smell them from here. Lovely fabric. Oh these are lovely! Gorgeous material. 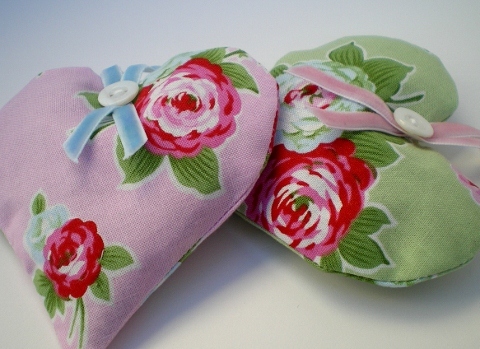 I bought some material (Cath Kidston no less - LOL) in a sale in the summer at John Lewis to make some of these hearts but haven't yet got round to making them (not done them before either) yours do look oh so lovely I hope when I get to do mine they look half as good! Men ay? These are precious!